Practices continued as they have the past few days. Today, they ended a little early as the players were to attend a team golf outing. 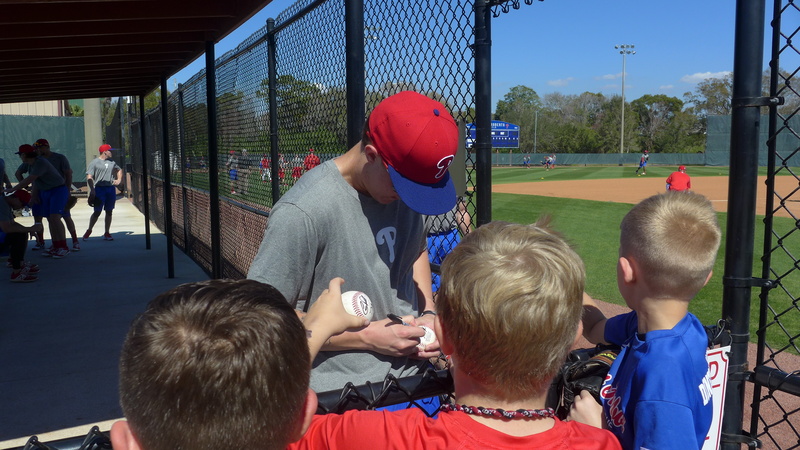 I have a little commentary, some photos of post-strength and conditioning Mickey Moniak, and lots of video mostly pitchers but also Moniak, Cole Stobbe, and Kyle Martin taking a few swings. On Tuesday, Dylan Cozens hit a HR to left center off Jerad Eickhoff during live batting practice. It cleasily cleared the fence, well to the right of the new scoreboard on Roberts Field. 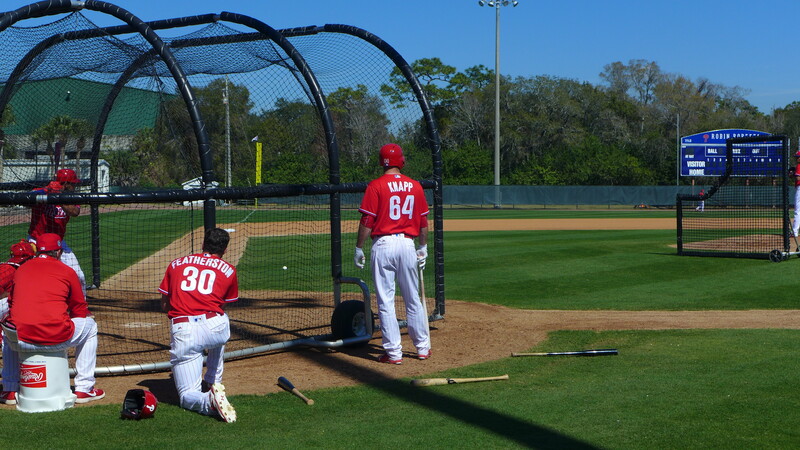 He continued to bash during regular BP off Chris Truby. He cut through the wind on a powerful drive to right that appeared to land on the hill leading up to route 19. Toward the end of the session, he hit all three pitches of one turn at the plate over the left field fence. He hits towering shots. Jorge Alfaro hits home runs on a line. He doesn’t get near as much altitude as Cozens, but his HRs get out quick. Scott Kingery is still showing HR power to his pull side, but usually within 40-50 feet of the pole. Mickey signing balls for some young fans. He posed for a photo after this and came back to fist bump each of these kids before returning to the field. Moniak’s first appearance last season. Can you distinguish any new body weight? 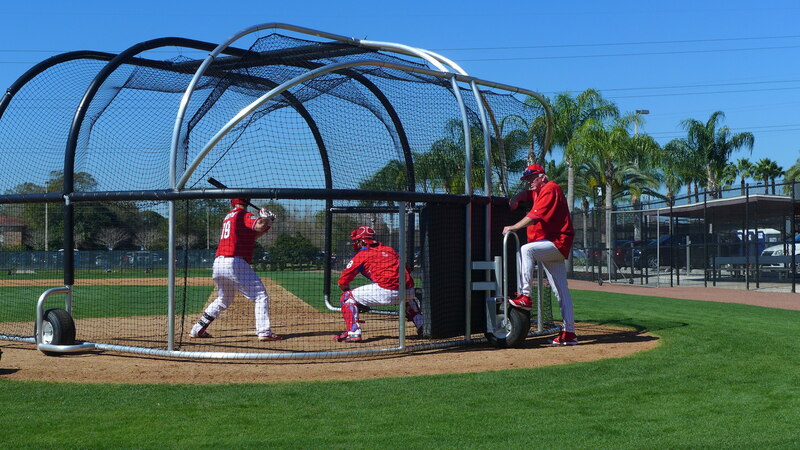 Here are several videos of pitchers throwing live batting practice. In order to keep the videos at a reasonable length, Most are just two pitches long. First up, Alec Asher 2 pitches, and Asher 2 more pitches. Elniery Garcia 2 pitches, and Garcia 3 more pitches. Mark Appel 2 pitches, Appel 2 pitches different view, and Appel 2 more pitches. Alberto Tirado 2 pitches and Tirado 2 more pitches. Edubray Ramos 2 pitches and Ramos 2 more pitches. Nick Pivetta 2 pitches and Pivetta 2 more pitches. Nick Fanti 2 pitches as he prepares for team Italy in the WBC. Mickey Moniak batting practice 4 swings. Kyle Martin batting practice 2 swings. Cole Stobbe batting practice 5 swings. 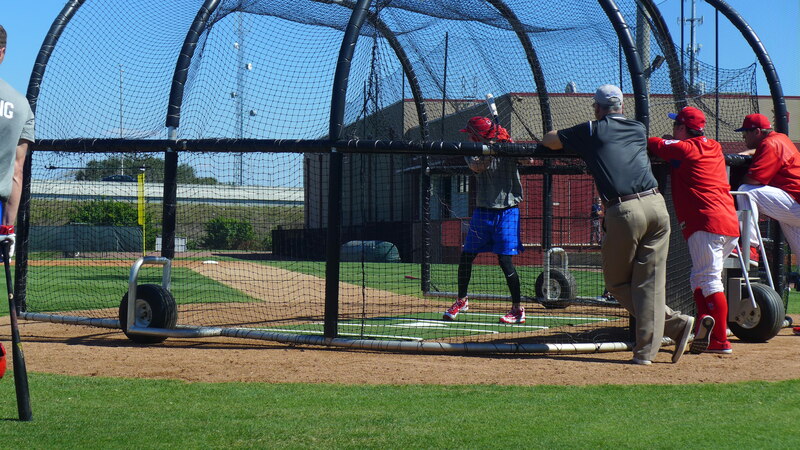 I think he went yard on two of these swings. Moniak looks the same to me. Is that the right answer? I saw many pictures of Moniak where he appeared to bigger and more muscular than last year. He’s young and big, so I’m sure the weight is well-distributed, which is why it may not be that noticeable. Jim does Kingery look any bigger , Mickey Mo looks OK . I saw Kingery this weekend he looks bigger to me. My son loves him since rhey share a birthday, so I see him alot. He looks pretty fulled out to me. When I took the photo of Kingery, I commented to a friend that he looked bigger. He certainly looks “thicker” than Mickey, but Kingery is shorter. He’s listed at 5’10, 180. Moniak has been updated to 6’2, 185. Funny I Instagramed Mickey’s Mo 1 pick had him in a Lakers uni his arms are bigger he’s starting to look the part. It seems like the team really pushed the idea of getting stronger this off season to many of their kids. Hopefully many got the message. Murray – I agree completely. That power to left-center is what made Howard special at his peak and could take Cozens to the next level. 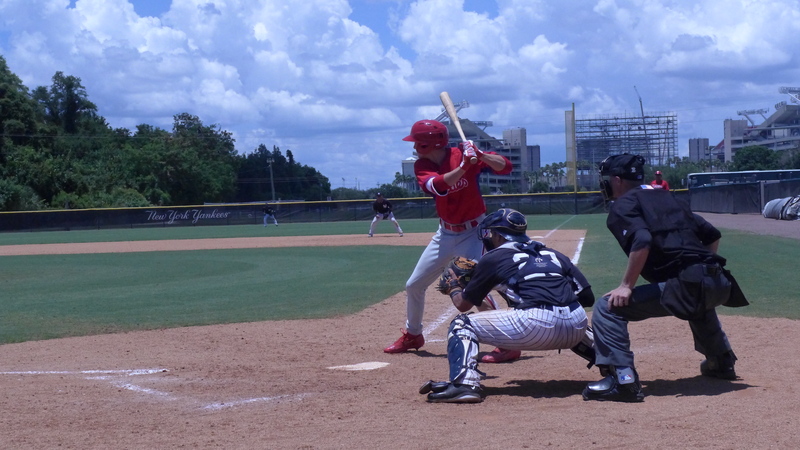 When he makes contact, Cozens has that same easy power to left field that Howard had. I watched many games on Milb.TV last year where Cozens just seem to touch a ball he hit to the opposite field and it went out for a homer. That swing, that type of hit is his ticket to paradise. Even if he only hits righties, Cozens could be a middle of the lineup force. We can worry about a platoon later. We’re talking 30+ HR, 90+ rbi if he only gets 450 ABs. I think that’s right. I think the platoons are going to make a comeback (or they should) and Cozens is a perfect candidate for that. I question when people say it is okay if Cozen only hits righties. The problem with this is relievers routinely come into the game in the 6th inning. If Cozens is in the middle of the lineup are you going to take him out for a PH in the 6th? You are using up your bench way too early. I don’t expect Cozens to ever hit lefties the same as righties but hitting say 180 with lots of K’s against lefties won’t cut it. They will have to PH for him way too early and often in the game. I see your point but it would depend mostly on the situation. Baseball is a game of situations. And what kind of lefty, quality, pitch repertoire, etc. My main justification is based on the production he gives vs righties. a dependable lefty bullpen arm is more of a rarity so teams use them wisely not foolishly. if they will use a lefty arm just to get one out in the 6th inning, it can back fire and will do more harm than good. if Cozen cannot really hit lefties, i can see this more as a problem during playoffs when teams extend their roster and have a luxury of adding bullpen arms to use in a match up situation. Cant wait till tomorrow. Wanna see what the possible future Phillies look like. I agree. I think Valentin starts in AAA with Kingery in AA but the two of them will be playing for placement. Pullin could start in AA but go to AAA if someone gets called up. Gomez??? Not sure.